As a part of our latest installment in our Best of Bushwick series, we asked our readers to nominate and vote for their favorite summer cocktails in the neighborhood. After posting our poll with Bushwick’s MVP list of frozen and iced drinks, we finally have a winner. The reader-voted best summer cocktail is “The Commodore” from El Cortez! The El Cortez owners also own the Williamsburg fried chicken haven The Commodore. So we’re not surprised that their Bushwick venture has a cocktail paying homage to their other spot. The Commodore cocktail is the jewel in the crown that is El Cortez’s long frozen cocktail list. 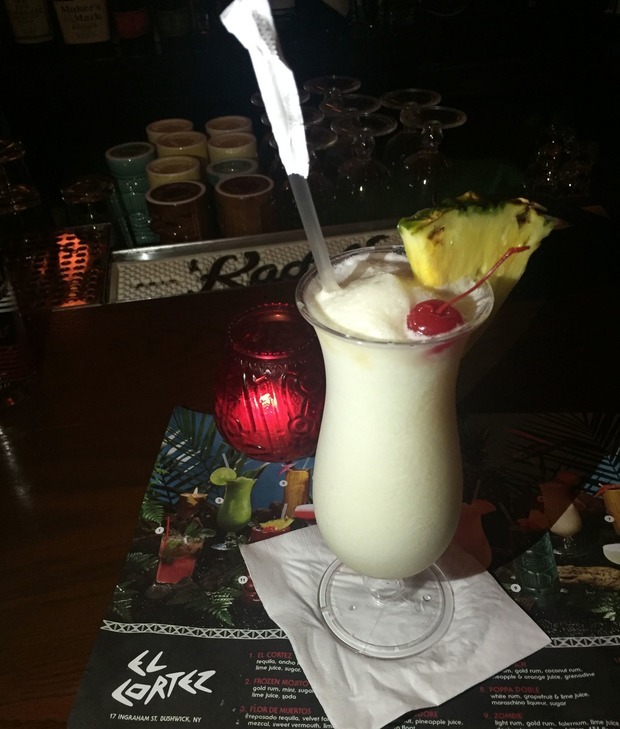 It's essentially a pina colada with a refreshing finish and flawless presentation. It is made with rum, coconut puree, pineapple juice, blended with ice for a frozen finish, and garnished with a cherry, pineapple slice, and an amaretto float. "We really appreciate Bushwick Daily considering us for best cocktail, let alone having won the poll," said El Cortez co-owner Taylor Dow. "We’re doing more early shows/bands upstairs in the Safari Room before DJs go on late night, for example we have Basside playing this Thursday." What better way to enjoy a DJ show and beat the heat than with a refreshing frozen drink from El Cortez? While we could definitely see any of El Cortez’s tiki-inspired cocktails topping this list, The Commodore makes us feel like we stepped out of the city and onto a beach. To sample this, and any of El Cortez’s other amazing drinks and awesomely indulgent snacks, stop by anytime between 4 p.m and 4 a.m.
Large bar/restaurant taking its decor inspiration from the tropics. Follow El Cortez on Facebook, Instagram and Twitter.